Odorcide Fire and Flood 16 oz. Odor caused by fire and flood damage can be difficult to remove because it can affect almost every surface in the building or house. Extensive drying, cleaning and deodorizing are needed in most cases to restore the structure to safe and livable conditions. 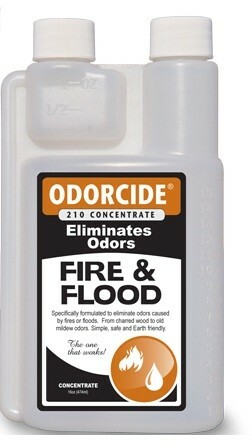 Odorcide Fire & Flood works through a process of counteraction and absorption to safely, but effectively eliminate the odor. Sold as a concentrate, the product is diluted with water and applied using sprayer and fogger applications. • Can be used in wet fogging systems in rooms or large areas that have been affected by smoke and/or water damage. damaged they can be treated per instructions for sprayer applications. • Water/Flood Damage – add 2-4 oz of concentrate per 1 gallon of water. Apply diluted concentrate to surfaces affected by fire, smoke or water damage. It is important to insure the product reaches the odor source at a concentration equal to or greater than the source of the odor. Absorbent cloth materials must be saturated to guarantee the solution reaches the malodor. If possible, allow the items to air dry (fans or dryers can be used to accelerate the process). Repeat, if necessary, to effectively reach the odor source in all areas. Close all windows & doors, cover any sensitive items that can’t be removed and turn on the central heating/air conditioning system. Dilute product per instructions and add to the fogger, carefully following the instructions supplied with the unit. Insure all people and pets are out of the area. essential oil blend and preservatives. Locate the source of the odor. For mold odors, the mold is generally visible and should be delt with directly with Odorcide and a fungicide. Mix Odorcide 210 Concentrate with water or disinfectant/fungicide at the rate of 1 to 16 (8oz. per gallon). After testing for colorfastness where necessary, apply sufficient mix to cover the contaminated area and to penetrate as deeply as the odor source. For faster absorbtion, this process works best on dry surfaces. For bare hard surfaces, spray bottles or pump sprayers are fine. For carpeted surfaces, Pressure Spray at 40 to 100 PSI, Inject or Pour on. To assure penetration, use a roller or simply walk the product in. Excess product can be extracted once you are confident Odorcide has reached the odor source. If any odor remains, Odorcide did not reach the odor source. Indentify the source of the odor. Dilute Odorcide at the rate of 1 to 64 with water (2oz per gallon). After testing for color fastness where needed, spray the mixture directly on walls, fabrics, etc. Apply sufficient product to cover the entire contaminated area and to penetrate as deeply as the odor source. This process will work best on dry surfaces. If the surface is heavily contaminated with smoke odor, use a dilution of 1 to 32 with water (4oz per gallon) to ensure success. Dilute Odorcide at the dilution rate of 1 to 32 with water (4oz per gallon). If you are using a non-handheld device, place the fogging device in the center of the area being treated and apply liberally. ULV foggers are recommended for use with Odorcide.